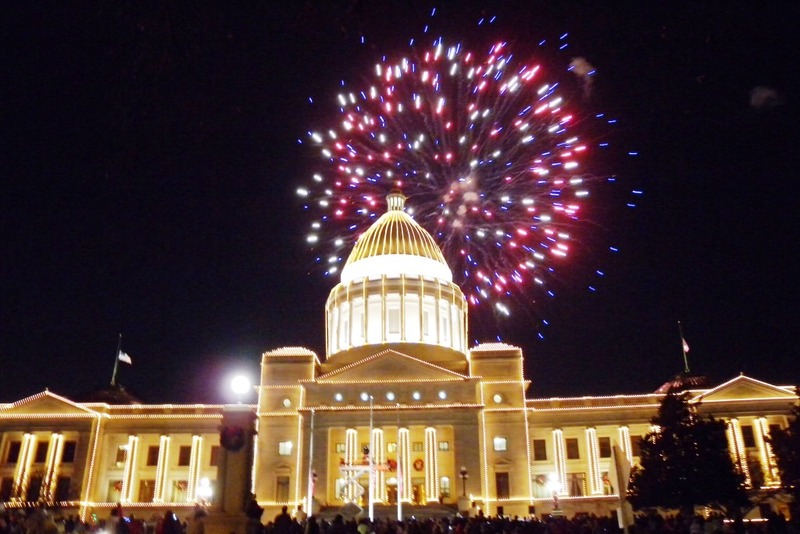 Arkansas became a state June 15, 1836, the 25th state admitted to the Union. La Petite Roche is how French explorers distinguished this site from larger rock outcroppings further up the Arkansas River. The first shack was built here in 1812, and it became territorial capital in 1821. Little Rock’s capitol is a reduced-scale replica of the nation’s capitol, with a 1,600-bush rose garden on the south lawn. The legislature meets here on odd-numbered years. The original town contains 3 historic districts with 135 buildings listed on the National Register. See the Old State House, which was capitol from 1836 to 1911, a President William Clinton exhibit, pre-Civil War buildings, and the only remaining building of the Little Rock Arsenal, a barrack where General Douglas MacArthur was born. The house in the opening of the TV show Designing Women is the historic district’s Villa Marre, built in 1881; the park in the opening scene of Gone With The Wind is at The Old Mill, laid out by Jefferson Davis in 1828. Opened in 2004 is the Clinton Library, on the banks of the Arkansas River, containing more documents and artifacts than archivists can handle in the next twenty years. The downtown playfulness; the humor and the history stretched along the river’s edge; the tree-lined city streets that witnessed crisis, and change; the acknowledgement of the past, and the moving on; the presidential pride. Mountains near: Ozark, Boston and Ouachita Mountains. Mount Magazine, in the west central part of the state, is the highest point in Arkansas at 2,753 feet.